Carmen Cowick is director of preservation services at Preserve This, where she provides training, support, and consulting services for libraries in the areas of preservation and collections care. Cowick, Carmen. Crash Course in Disaster Preparedness. Libraries Unlimited, 2018. ABC-CLIO, publisher.abc-clio.com/9781440860522. 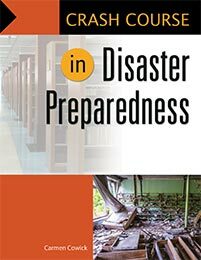 Every library needs to have a disaster management plan in place before disaster strikes. This short but thorough manual makes preparing for disaster less intimidating.